Sometimes I get kinda sad when I see little girls twirling around in frilly dresses. That is because I don't have any daughters. When the kids were younger and we went to toddler birthday parties, I would purposely go to a kids clothing store to buy the present there. No way would I buy a toy! Then I'd miss the chance to hold and feel and BUY a beautiful little dress for the birthday girl. Number 5 was probably in kindergarten when I met her. Now she is going into the fourth grade and she is growing so fast. It's almost shocking sometimes. I see less and less "BABY" in her and more and more "YOUNG LADY." Even when I played Yamslam with her last week, I couldn't believe how gentle the game was. When I play with my boys, it's so loud and rugged. Not surprisingly Number 5's tastes are becoming more refined as she gets older. 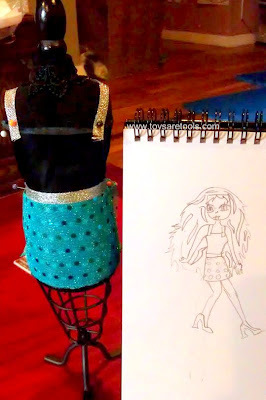 She is starting to even care about designing clothes and spends a lot of time sketching different outfits and grooming her Monster High dolls' hair. She is a serious kid when it comes to grooming. No one is allowed to touch those dolls except for one or two of her friends. 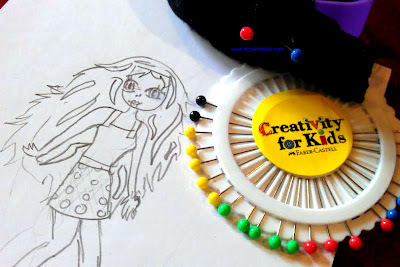 It should come as no surprise that upon asking her to be my tester, one of the toys she was really really really interested in was the multi-award winning Designed by You Fashion Studio by Creativity for Kids. 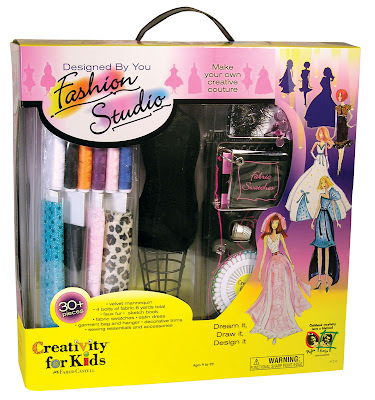 I was a little worried because at the time we hadn't had enough experience with Creativity for Kids products and I was concerned that the kit would be too flimsy because creating a great fashion designing kit can't possibly be easy to do. This set even comes with a wrist pincushion. How professional! I say this because children know so much and can do so much now. They are able to make videos at age 3. They can look up information in minutes that used to take us hours to do because we had to go to the library and look up the Encyclopedia Brittanica. What I'm trying to say is that kids are more sophisticated these days and so they will respond more favorably if their toys are just as sophisticated as they are. Easing the Creative Process Helps a Lot! The Fashion Studio meets those demands. While other kits may be lower in price, this kit is giving you things that I've never seen in a children's kit before, such as a mannequin, swatches, a plain satin dress to be adorned with whatever beautiful lace or design details your child wishes to use. But here is the secret to its success. The Fashion Studio makes designing clothes incredibly easy because you don't have to sew anything to dress the mannequin. 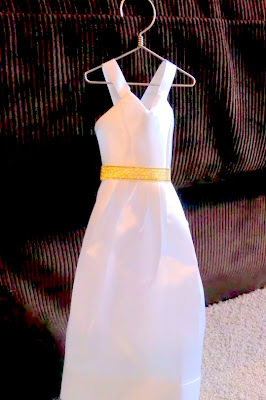 You just cut some fabric and pin it onto the mannequin to help your child visualize what the outfit should look like. You can't do that with a Barbie doll. Even if your child was willing, the needle will not go through but on the mannequin, it most definitely will! What a great job she did. She is just 9 years old! I love how this set encourages you to draw first and then cut. In that sense, this design kit is very similar to magnetic blocks because it is so easy to put something together and tweak as you go along without worrying that everything will fall apart. There are plenty of pins. It's unlikely you'll run out of them and the ends of the pins are bulky and colored so you can find them should you drop one. I love when quality shines through a product like this. Number 5's mom even remarked that the scissors were good too. I have noticed scissors in kits and always wondered why companies bother. We all have scissors at home. But I'm glad Creativity for Kids put a small but sharp enough scissor in the kit. It really works when cutting fabric. Regular kid scissors can't really do that so well and would likely cause an unwanted cut in an unwanted place. This is so gorgeous. Even the hanger is gorgeous. What kid wouldn't feel good dressing up a mannequin. I love how they've even included a sketch book to go with the kit. Kids should be drawing their designs on paper first. I think it's a great way to create your vision and then test it out on a mannequin. That gives children the chance to practice planning and tweaking as you go along. It really does support more patience and perseverance in work. Lastly, I also love that much of these things including the mannequin can be reused. If your child gets really serious, it won't cost much to buy more fabric and perhaps you can use something that you already have at home. Number 5 loved this set. At one point when her mom tried to give her a hug after showing her the Fashion Studio, she said, "Mama, get away from me so I can DO this!" This is the kind of toy that excites a child so much that they need to be told to stop creating and to go to sleep! Ugh! Stil.... to be sure, it's one of those problems that you rather have than not have. Put Designed By You Fashion Studio in your shopping cart today!